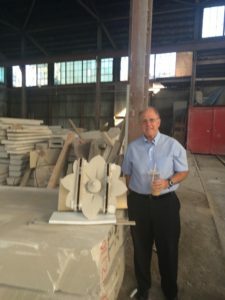 Ralph Petrillo, co-owner of Mount Vernon stone company, Petrillo Stone, is approaching his 40th anniversary of his work in the family business, founded by his grandfather in 1907 after emigrating from Italy. While much has changed over the past century, like stone, many aspects of the dimension stone industry remain constant. Ralph Petrillo calls the business “a bridge between three generations of workmanship, ideologies and technology.” After learning about the industry from their father and grandfather, today Ralph and his brother, Frank, continue the legacy. “I always get a kick out of when we replace stones from a building that my grandfather or father originally worked on,” Petrillo said. One of the biggest changes Ralph has observed since then is that stone is now manufactured and cut in locations throughout the world, and then shipped to New York City. When Petrillo Stone began, all stone had to be cut in the same state as the project location, according to Ralph. With the changing industry comes new problems. Due to the worldwide scope of the stone industry, Ralph faces a new set of challenges than his father and grandfather. “The biggest challenge in my work is being competitive with the factories in other places where labor, electricity, water, and property is cheaper,” Ralph said. Ralph’s insight to the changes is rooted in decades of experience. He and Frank were exposed to the stone industry from an early age. “As children we would come to my father’s office, go out into the shop and see the men busy cutting stone. I vividly remember when our shop was cutting the Classic Roman Travertine for many of the Lincoln Center Buildings back in the 1960s,” Petrillo said. If we could compare that shop from the 60’s, to how it looks in present day, we would notice changes, but we would catch some similarities. “Although many of our machines have changed throughout the years, we still have some very old, very important machines which date back many years. As far as architecture is concerned, we can fabricate almost anything that an architect in the know can imagine. Styles are always changing, but we are constantly making stones for new building and buildings that are over 100 years old,” he said. Those deep, historic roots are one of the things Ralph appreciates most about the business. He views his work as a connection from the past, to the present, and into the future. “What I enjoy most about my business is the history of all the work we have done in the past and the work we are doing now, which will be making history for future generations,” Petrillo said. When asked about the type of stone jobs he prefers to work on, Petrillo said he particularly enjoys fancier, more challenging jobs, since Petrillo Stone has the capacity to handle challenges that many competitors do not. “We have the capability to draft and fabricate almost all types of natural stone work. An example of this type of work would be the Gothic Styled arches and tracery windows at Keating Hall at Fordham University,” Petrillo said. Besides their unique skillset, something else that sets the Petrillo brothers apart is their dedication to quality. “There are 2 ways of having quality control of the outgoing completed stonework. Both are done in my shop and at most shops. One way is simply having an expert go over every stone which is ready to be shipped out and checked over. Another way which has become very popular is a dry layout involving the architect going to a factory to look at many of the stones that are completed and approve them on the spot,” he said. Through his work, Ralph Petrillo has had the opportunity to work on some of his favorite buildings. “I have a few favorite buildings which my business has done the work on in the past and recently. Two of my favorite buildings that we originally did the work on are the Metropolitan Life Insurance Company Building and the Metropolitan Opera House at Lincoln Center. Recently we supplied many new art deco stones to the New York Life Building which I think is really an incredible building as well,” he said. Now that he’s celebrating 40 years, there is a burning question on our minds. Will the next generation continue the legacy? As of now, the answer is unclear. “As far as a next generation running our business, that is an unknown. My brother has 3 boys and I have 2 young girls. It is an interesting concept. I guess we’ll have to wait and see,” Ralph said.